Apparently, it has been established that it's not cool to like any DIMMU BORGIR album released subsequent to "Death Cult Armageddon" and in even smaller circles anything released since "Puritanical Euphoric Misanthropia". What is this? Junior high? Get a clue. Don't look for jagged edges or the skeletal remains of Satanic ritualistic mass execution and you'll not be so disappointed. Since "Abrahadabra" falls short of the superb level of compositional dynamics achieved on "In Sorte Diaboli" (admittedly, a divisive album), most outside of the delusional will find the new disc minimally disappointing. But it's really not that simple. "Abrahadabra" has a good deal to offer. Truthfully, the absence of drummer Jan Axel "Hellhamer" Blomberg and session crooner/bassist I.C.S. Vortex (a.k.a. Simen Hestnaes) is noticeable, though not crippling by any means. "Abrahadabra" still stands on its own two feet as an intelligently composed, highly melodic, and often epic work of extreme metal, even though the band no longer emits the Luciferian waves of fear and confusion so characteristic of the act's pre-breakthrough works of obsidian art. Concerning DIMMU BORGIR's earlier works of symphonic black metal terrorism, it is safe to say that those days ain't coming back. Holistically speaking, the lush orchestration of "Abrahadabra" that both bolsters the melody lines and floods the room with light (too much at times) enhances the listening experiences and at least sounds fantastic. That's what you get when you enlist the services of the Kringkastingsorkestret (Norwegian Radio Orchestra) and the Schola Cantorum Choir. While the orchestration can have the effect of smoothing the rough edges completely out of the mix, including the relegation of guitars to equal-partner status, there is little question that the band's only concern is that the whole be greater than the sum of its parts. For example, the lead guitar work on "Renewal" and "Dimmu Borgir" isn't exactly sinister, but it is effective in reinterpreting the melodies. After an instrumental in "Xibir", which sounds more like fantasy film scoring than music announcing the horned one's return visit to the Billboard chart, one is treated to five dark beauties in a row, three of which are gems. "Born Treacherous" is the biggest attention-trapper with its aggressive movements working in unison with a classy choral sweeps, as well as a little groove to go with the now secondary-sounding (though not pedestrian) croak vocals. Agnete Kjølsrud's (DJERV) soaring guest vocals are one of the main reasons that "Gateways" is impossible to forget. "Ritualist" benefits from its furiousness, a punctuating refrain, and a rapturously epic mid-range vocal part. The album then starts losing steam during "The Demiurge Molecule", which never really goes anywhere of interest, and the ho hum "A Jewel Traced Through Coal" before "Renewal" arrives and regains some of the lost momentum. Wrap-up "Endings and Continuations" though is strong. The cut actually sees the band reclaim at least some of its earlier career franticness and attaches to it the orchestration and raised level of melodiousness that defines the current era, making for a grand closer. 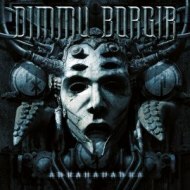 Being DIMMU BORGIR ain't easy in scene today that is long on expectation and short on attention span, not to mention one that views the fulfillment of sales potential as tantamount to treason. But the fact that "Abrahadabra" is a good enough album to receive a score well above average by metal standards and still be considered by some a failure of sorts says something about this immensely talented band.